When I read this 20 years after writing the entry, my initial reaction was an eye-roll and shaming thoughts consisting of "I sound like such a victim. A spoiled brat. Why did I let that go on for so long?" In other words, I had very little empathy for myself; that is until I went further back in my journal and realized WHY I didn't end it. I believed that I loved this man, that I should love him, and wanted so much to feel in love; but what I really craved was the addiction, the intensity, the push/pull that I had experienced in my previous relationship. I wanted to feel hooked-as if I couldn't live without him; because to me, in 1997, that's what loving someone was supposed to feel like. I spent most of 1996 recovering from a Titanic breakup and all of the detriment I'd caused in my life leading up to it. During that relationship, I was unknowingly holding everything together with Scotch Tape, and after it ended I found myself surrounded by numerous tiny pieces of Jodi that demanded immediate attention. Love Addicts are addicted to being loved, but more specifically to feeling loved, to chasing love, to creating love where there is none. It's exhausting and debilitating and, in extreme cases, can literally kill a person due to the self-neglect that occurs. 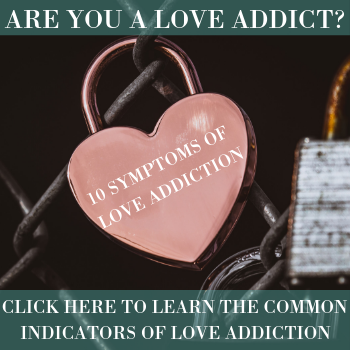 But here's the thing: As obsessed with the idea of love as one may be, the Love Addict can't tolerate healthy love or true intimacy because it's so terribly uncomfortable. What's Love (Addiction) Got To Do With It? One of my biggest accomplishments of 2018 was cleaning out the storage unit I'd kept in NYC for over ten years. My long-term relationship with Manhattan Mini Storage actually began many years earlier (what REAL New Yorker DOESN'T have a storage space? ), but I entered a commitment with this particular 8x10 unit in 2009 when I left the city to attend graduate school in Oklahoma. At that time, I knew that if I didn't just do it- just leave and put everything in storage and deal with the emotional exercise of sorting ,packing and moving later- I might not ever get out. And I had to get out -right then- otherwise I honestly believed something very bad was going to happen.